This property, which overlooks a lake just 25 kilometers to the east of central Bangkok, was (initially) in an exceptionally rundown condition. The DKFF House took three years from inception to completion. The structure of the house is a combination of RC post/beam and steel frame while the gray and white stone used as cladding material is from China. The external finish is either polished cement or corrugated metal. The owners and the architect like this material for its industrial elegance and solar protection. Extensive solar studies were carried out before deciding on the roof material. A planted sedum grass roof was seriously considered, but eventually a decision was made to go for a relatively light roof, one insulated with shredded newsprint. 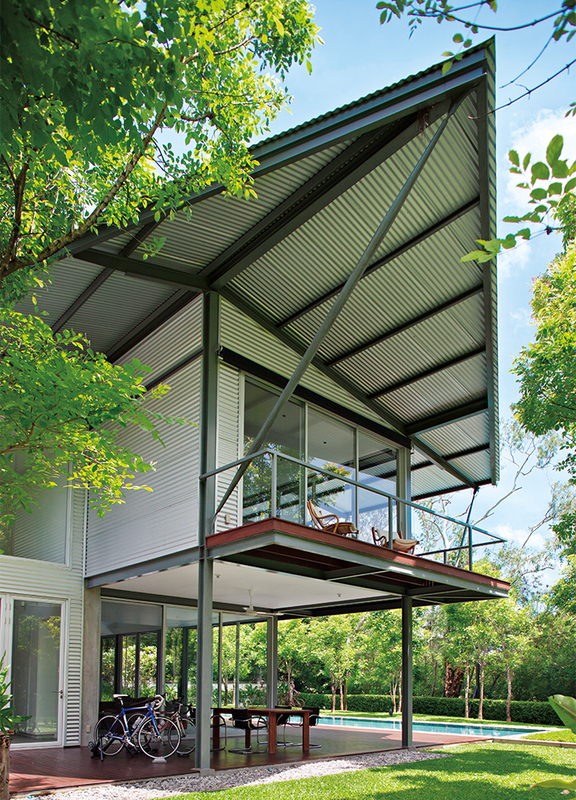 A unique feature of the house is its steel roof propped up by steel struts. The roof has wide over-hanging eaves to shade the glass and for energy conservation. Diagonal bracing at the end of the roof adds to its elegance. Appropriately, the house now sits like a bird on the site, appearing, with its expansive roof profile about to take off in flight. The two –story, one bedroom house has a remarkably simple plan orientated west. 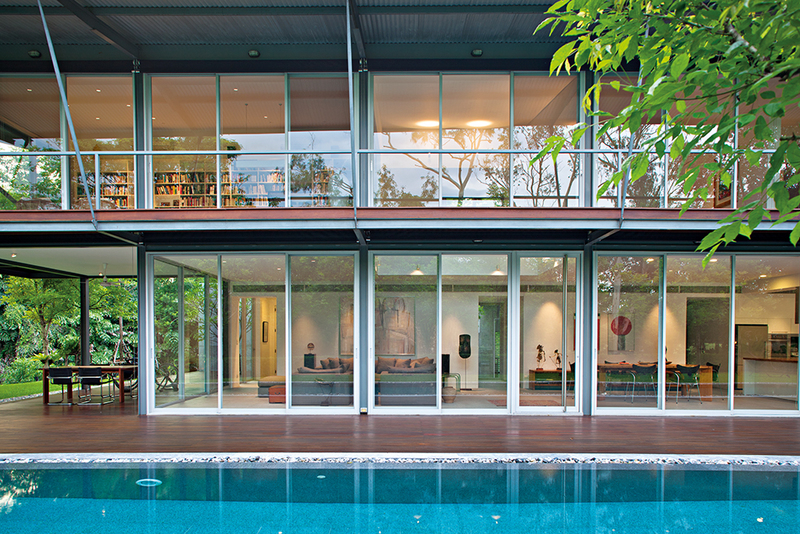 The ground floor consists of a two-car carport leading to a spacious entrance porch that gives access to an open-plan arrangement of kitchen, dining area and double- height space connecting to the living area over-looking the outdoor lap pool and timber deck that runs along the west side of the house. There is a TV/guestroom and the usual back-of-house provision, including maid’s accommodation. 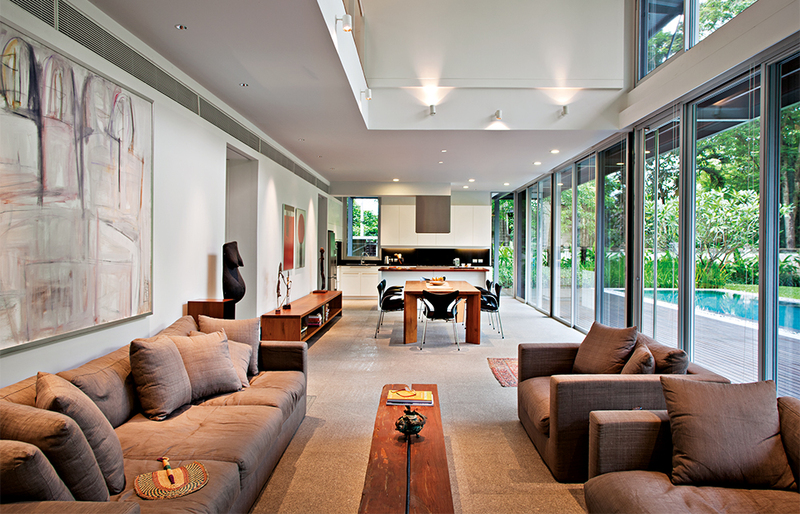 The upper floor consists of a study, master bedroom suite, huge bathroom and exercise room. The west- facing first story veranda shades the lower floor in the afternoon. Trees help to reduce solar heat gain and there are external motorised louvers. Sliding doors on the west side are full height and can be opened to permit natural ventilation or closed for air-conditioning. The prevailing wind blows over water and the house cools quickly because of low thermal mass, green surroundings and cloud cover. In the garden there are several pieces of sculpture made from recycled bicycles by the famous Thai artist Saiyart Sema-ngern. This article was published in the September 2016 issue of Inspire Living Magazine. Download it here!